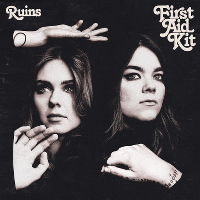 Despite their relative youth, Swedish sister duo First Aid Kit are slowly but surely establishing themselves in the arena of folk rock. If their 2014 album ‘Stay Gold’ was a career breakthrough for Klara and Johanna Söderberg, then new fourth album ‘Ruins’ is the work that will solidify their position as serious and dedicated musicians at the precocious respective ages of 25 and 27. The LP was produced by Tucker Martine and features contributions from Peter Buck (R.E.M. ), Glenn Kotche (Wilco) and McKenzie Smith (Midlake). The sisters Söderberg have undergone a renaissance since the heady days of ‘Stay Gold’. As detailed in the press release for ‘Ruins’, extensive touring led them to a breaking point, and for the first time in their lives, a physical separation. Johanna settled in Stockholm while Klara decamped with her fiancé to Manchester “to escape and find her own space.” But as Klara’s romantic relationship dissolved, she found her personal and professional relationship with her sister evolving in a positive way, and those events collectively inspired the songs on ‘Ruins’. ‘Ruins’, according to Klara, is “a documentary, and it’s quite sad.” It chronicles the end of Klara’s engagement without any poetic or musical equivocation. Unlike their previous albums, which leaned heavily on the pure beauty of the sisters’ seamless vocal harmonies, lyrics and authentic emotion are the main focus points on ‘Ruins’. “We don’t want it to feel perfect,” says Johanna, who served as a sort of editorial director for Klara’s songwriting on the album. “We want it to feel rough, gut-wrenching.” Opening track ‘Rebel Heart’ strikes immediately, with angular melodies and echoing vocal harmonies over a persistent, heart-thumping rhythm. The measured yodel in Klara’s vocal line, “why do I keep dreaming of you?” conveys an intense longing as she laments the self-perceived shortcomings that may have broken her romance apart. Sweeter in tone and more country-tinged, ‘It’s a Shame’ strategically places its vocal harmonies over shuffling percussion and spare guitar chords. Here, Klara flirts with denial of the relationship’s demise, positing “maybe it’s all right / if I just spend the night” ahead of the clever harmonic modulation in the song’s anguished bridge section question “who have I become / who will I be / come tomorrow?” Current single ‘Fireworks’ poses a similar self-examination, “why do I do this to myself every time?”, but in a more muted and introspective musical context. The song’s ethereal backing voices imply a sense of detached memory, while the specific imagery in its title is expertly text-painted with muffled, distant sounding percussion. At the heart of the album, ‘Postcard’ and ‘To Live a Life’ touch on the long-distance aspect of the central relationship, with anachronistic references to letters and phone calls rather than e-mails and text messages. But these allusions to tangible, if old-fashioned, things demonstrates both the charm and the skill in First Aid Kit’s songwriting; mentions of pop culture would certainly have felt out of place in the sonic milieu of guitar, pedal steel and high-lonesome harmonies. The songs on the second half of ‘Ruins’ take on a more pensive tone as their themes progress to healing and acceptance. Title track ‘Ruins’ finds perspective in some of Klara Söderberg’s most profound lyrics, “I lost you, didn’t I? / but first, I think I lost myself.” Straightforward folk ballad ‘Hem of Her Dress’ alludes to the bitterness of seeing a former partner move on, and while the drunken singalong coda feels awkward, there’s no questioning its reason for being. Existential final track ‘Nothing Has to be True’ brings the album to a resolute close, declaring “we might have seen something / but we ain’t seen nothing yet” before diving headlong into a lengthy instrumental outro whose bold musical momentum clearly demonstrates First Aid Kit’s newfound conviction. ‘Ruins’ is a mature album for two women still so young, but its real strength lies in its sense of resilience. There is very little about this album that feels jaded, despite heavy thematic material and a vintage folk musical style. Instead, First Aid Kit have allowed their life experiences to revitalise their passion for making music, in the process crafting a collection of strikingly spirited and exquisitely emotional songs. ‘Ruins’ is due out this Friday, the 19th of January, on Columbia Records. TGTF’s previous coverage of the sisters Söderberg is collected through here. For the soundtrack to the Reese Witherspoon film drama Wild released last autumn First Aid Kit recorded a breathtaking cover of R.E.M.’s ‘Walk Unafraid’. While we knew that they sisters Soderberg filmed a promo video for their version of the song, we didn’t know that during the down time of the making of the video, someone had the good idea to film this live acoustic performance of the sisters singing the song while R.E.M.’s own Peter Buck played backing guitar. You can watch both the live performance and the forest atmospheric promo video for the song below. TGTF’s past coverage on First Aid Kit is here. The sisters Soderberg, aka massively popular folk duo First Aid Kit, have released the promo for the title track of their current album ‘Stay Gold’, their third released in June on Columbia. The lighting’s a bit strange on this one, but I guess they were trying for that dramatic, ’70s, distressed and aged photo look. Watch the video below. Johanna and Klara Soderberg, better known as First Aid Kit, are riding high these days on their success. Who would have ever guessed a couple years ago that two sisters from a suburb of Stockholm would be able to capture the imagination of folk music lovers around the world? This summer, they released their third album but their first for a major (Columbia), ‘Stay Gold’. In this live video, the sisters perform an acoustic version of ‘Master Pretender’, one of the standout tracks from their latest album. In it, while they look like they’ve been filmed in a time gone by, their unmistakable harmonies are beautiful as they ever were. Watch it below.